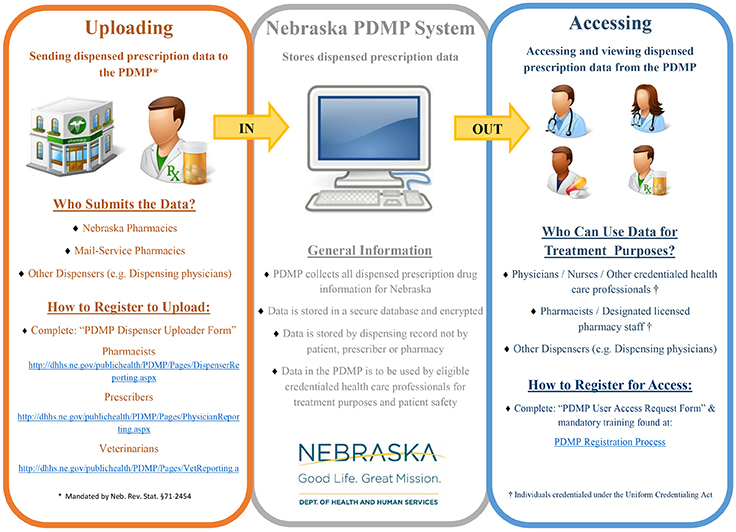 Launched at the beginning of 2017, the new Nebraska Prescription Drug Monitoring Program (PDMP) is offered as a stand alone medication query platform and integrated into the NEHII HIE. The PDMP was enhanced per legislation (LB471, 2016) to collect all controlled substance prescriptions which are dispensed from pharmacies and other dispensers on a daily basis. The PDMP allows prescribers and pharmacists to view those prescriptions to prevent the misuse of controlled substance prescriptions. Beginning January 1, 2018 Nebraska began collecting all dispensed prescriptions so that the clinicians can better monitor the care and treatment of their patients. The PDMP is integrated within the NEHII Health Information Exchange to facilitate an improved workflow for providers. © 2019 NEHII | Nebraska Health Information Initiative. All Rights Reserved.